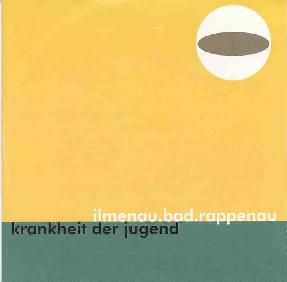 Krankheit der Jugend - "Ilmenau.Bad.Rapenau"
I've got very little info on this band but I know they're from Germany and that this is their 12th release. According to the promo material the CD tells the story of Mr X and Mr Y who travel (for unspecified reasons) from Bad Rappenau to Goa, India, by visiting places like France, Italy, and Ilmenau. The music takes a few tracks to really take off and there are several transitional bits that include conversations and crowd noises, presumably representative points on Mr's X & Y's journeys. Some of the music has a raw sound. "A8, Hit2" is repesentative of this side of the band with its electro dance beats and pop sound, but also wah'd guitars and a bit of a pop-psych edge. "Juhu Guru" starts off sounding like college radio rock, but quickly develops into a jamming tune with trippy guitars that crank out bashing chords and acidic licks. The guitars rumble, shimmer, and wail throughout the track's 8 minutes, and while it didn't get me too overly excited it was still a cool rockin' psych jam. Following this theme, "Tegno" is a much more interesting and spacey track. Ambient bubbling space guitars trip along to a busy rhythm section, with the percussion in particular being prominent. The steady rock drumming and simple but persistent bass line contrasts with the space guitars but it's a combination that works well. During the last two minutes of the track the guitars start to get more intense, as if ready to burst from the confines of their starship. Another standout track is "Laut & Luise", a metallic mind-piercing noise-psych jam that is way too brief at only 3 minutes. Just as the song really takes off it ends which was a bit of a disappointment. "Bahn" is a 17-minute track that opens as an ambient guitar/synth piece and we hear the sound of a train rolling along. It soon segues into a quirky wah'd piece with wild efx'd vocals. This soon ends VERY abruptly and after several seconds of silence we're back on the train having briefly returned to the opening theme. The mood then darkens and looped synths and various other electronics serve as an intro to what becomes a catchy melodic piece that is kept interesting by the addition of wild spacey synths. You've probably caught on that this track is all over the place, but I gather it's all part of the our heros' journey. "Goa" is the journey's stated destination and a powerful psych-rockin's closing track. One of the CD's more intense tunes. In summary, Krankheit der Jugend has produced a set of varied themes that straddle the border between accessible pop and freaky experimental psychedelia. Its doesn't work consistently throughout the album, but the tracks that grabbed my attention were solid. I'd be interested in exploring more of their back catalog. For more information you can email Krankheit der Jugend at werk512@aol.com. You can also visit the http://www.130db.com web site where there are some sound files you can sample.